Philips has unveiled its latest digital audio player, the Go Gear Spark – with this diminutive player serving up six models all with an OLED display. The Go Gear Spark Range features a 'smooth and square' design and all six versions are just 41x41x15mm. The Sparks have a 1.46-inch 128x128 OLED display that Philips insists is perfect for showing album art or photos. The Spark is available in 2GB 4GB or 8GB versions, with half of the range coming with FM tuners and the other half without. 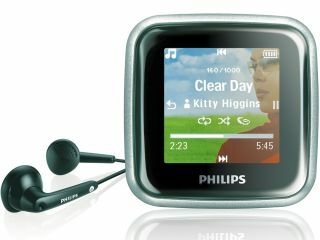 Philips has included a built in equaliser and thrown in 'high-quality' headphones to show off its 'Fullsound' system. "The Fullsound system seeks to enhance the dynamics, bass, treble and stereo imaging of highly compressed MP3 files by restoring them closer to the levels found on the original recording," says the release. Thetransfer is through drag and drop – with no software needed, which is good, and connection is through USB 2.0. Pricing is from £39.99 for the 2GB no radio model up to £59.99 for the 8GB with an FM tuner model. The latter is not hitting shops until May but the four of the models are available in March.